Yabu: The House of Katsu SM Aura branch is located at the mall's gorgeous SkyPark (Same floor as Coca). 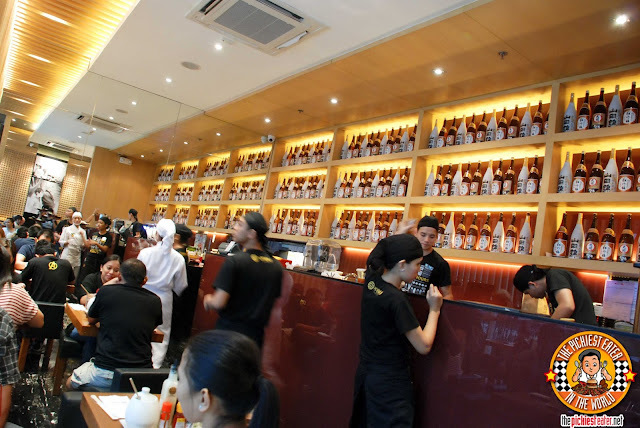 Like its other branches, it maintains that zen-like feel, with playful Japanese Anime inspired portraits adorning the walls. One of the few salads I eat, is Potato Salad. Yabu's Superior Potato and Egg Salad (P195) reaffirms that. 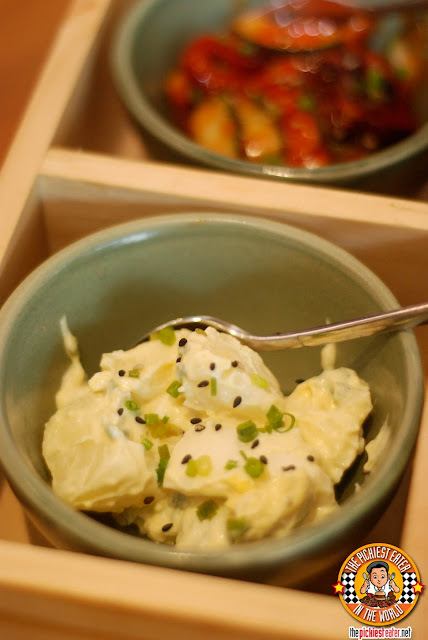 Huge chunks of potatoes and hard boiled egg, balanced by a Japanese mayo blend, giving it a nice creaminess, and a touch of acid at the same time. Rina was intrigued by the new addition to the salad menu.. 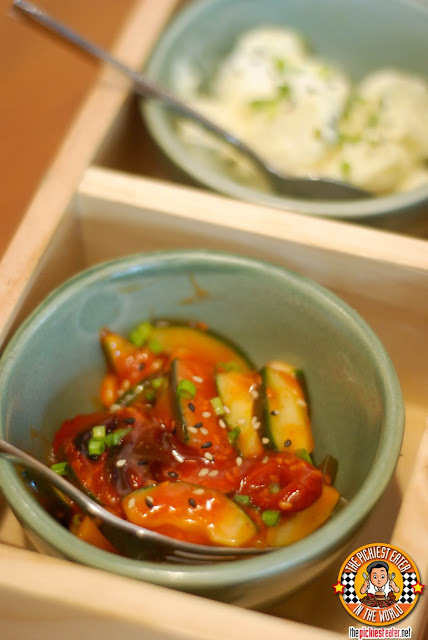 The Iidako Salad (P195). 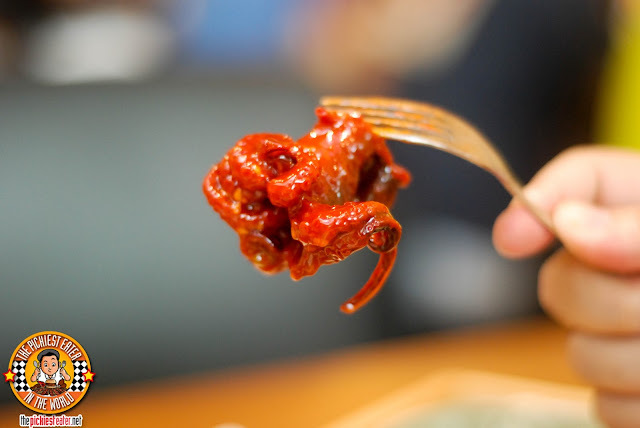 This was bits of Baby Octopus bathed in a Japanese sweet sauce. Eating octopus is a little bit too weird for me, so much to the delight of Rina, I passed on this, allowing her to devour the whole bowl all by her little sweet self (She's so adorable). Here's a little tip for you: When you go to Yabu, order the Layu sauce (P35) for yourself. Do NOT share with anyone. You're going to need each and every morsel of that little bowl. Trust me on this. How do I describe it.. Hmm.. ok.. So, You know that Chili Garlic Oil they have in dimsum restaurants? I always watch in envy as my friends make a mixture of soy sauce and that Chili Garlic Oil with calamansi, simply because It's a bit too spicy for me, and it might trigger my acids. Guess what? 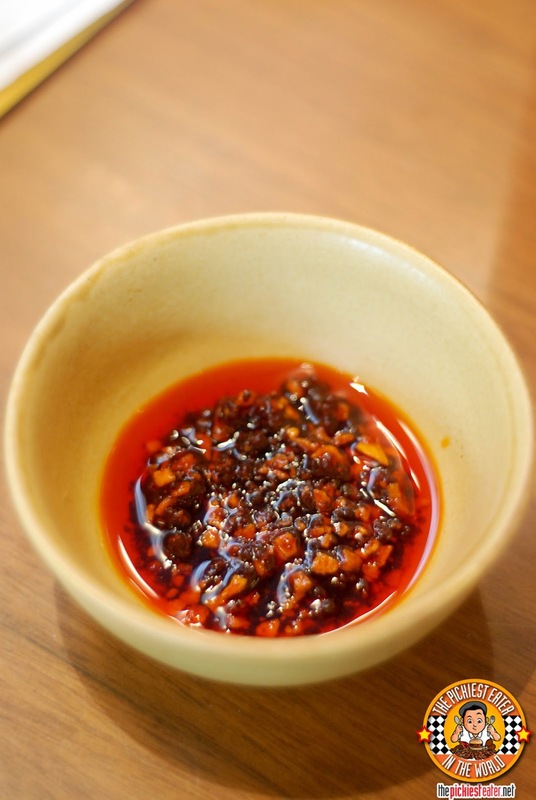 This is Chili Garlic Oil done right. 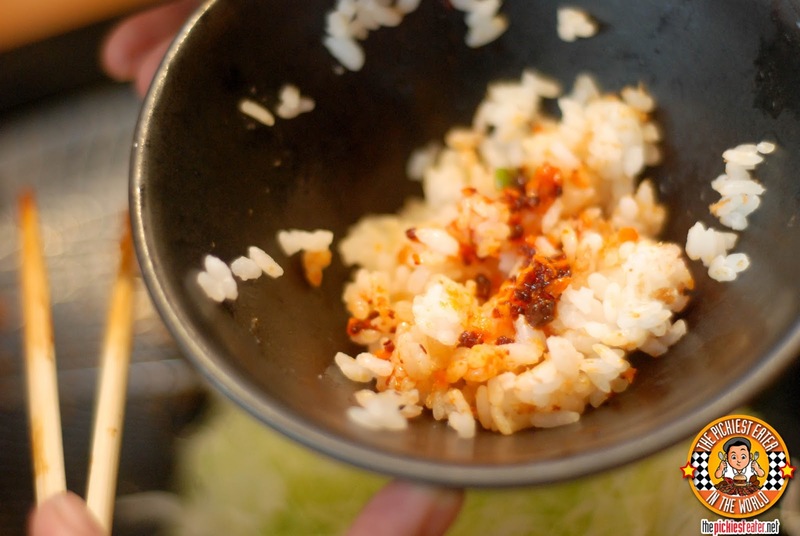 You get the kick of the garlic, without the overwhelming heat of the chili! And the good thing about it is, it goes perfect with all the Katsus! What I did, was pour it straight into my rice and mix things up a bit, ensuring I get a bit of that garlic flavor in every bite. 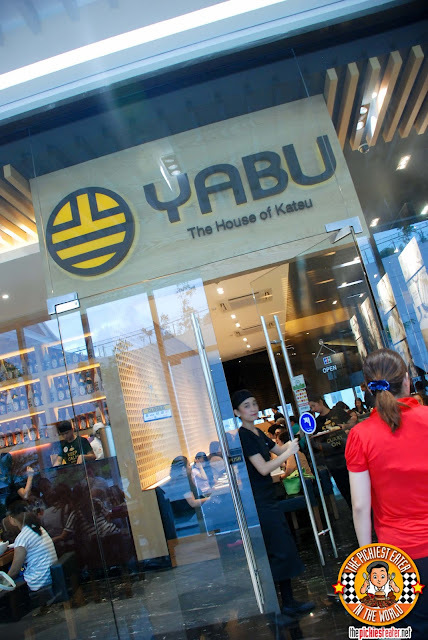 In case you're a Yabu newbie, a "Set Meal" consists of unlimited Organic Brown Rice, Unlimited Miso Soup, Unlimited Organic Cabbage with with Wasabi or Shoyu Dressing, Japanese Pickles, and a bowl of fruit. Although I mentioned that they're (in my book) on the top of the Katsu heap, that never stopped Yabu from innovating their successful products. 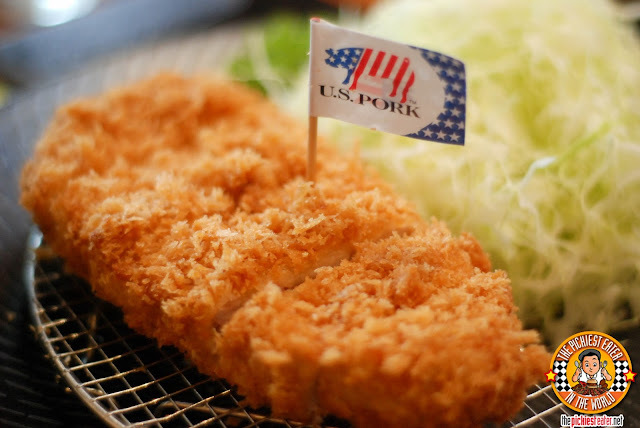 Their popular Rosu Katsu Set (P405), is now made with U.S. Pork! The U.S. brand offers an even softer meat than its predecessor, and a more pronounced meaty taste. Admittedly, the dish I was most eager to try was the Kurobota Miso Katsu Set (P580). It was the gloriously tender cuts of Black Berkshire Pork that we know and love, laying on top of a thick, sweet sauce, with the right hint of saltiness to whet your taste buds. I am a fan of mixing sweet with savory, so this one was a hit with me. The sprinkling of spring onions on top was the perfect compliment to an amazing dish. 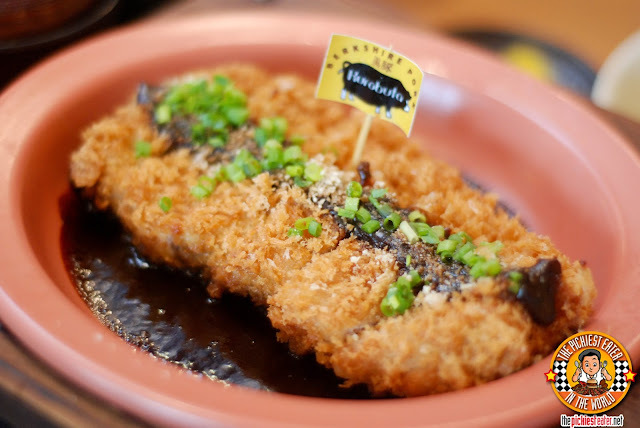 Since my last visit, to Yabu SM Aura, they have already opened two more long awaited branches: SM North EDSA and Alabang Town Center, expanding the reach of their awesome Katsu goodness. Again, based on my experience at the SM Aura branch, it would be best to come in a little early, perhaps a bit before 11:30, because the place will get full. 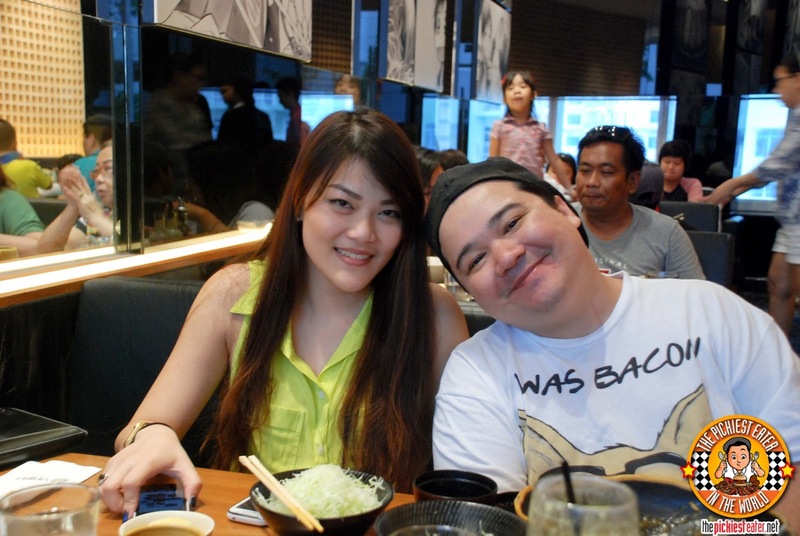 Oh, and a shout out to Erika and Eugene for yet another wonderful Yabu Experience! I don't mean to confuse you all.. These technically aren't "New" dishes, because they've been available since around July or so. But it was my first time to try them, so they were new to me. Oh pretty good here...The food looks yummy! You really should go Cutella!